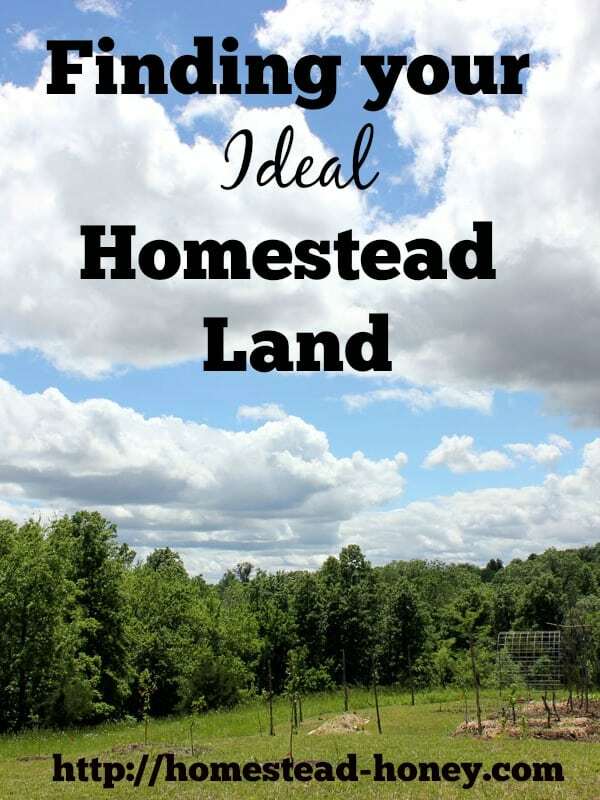 Finding a piece of land on which to create your ideal homestead is a rather subjective process. Aside from a few traits that I would consider non-negotiable – a water source and some southern exposure – I’d be hard pressed to give a list of “must haves.” After all, each family’s needs will be different, and your own personal preferences and available finances will play strongly into your decision-making. When we purchased our Missouri land, we paid a lot of attention to community and neighbors. We wanted to live in walking proximity to friends with whom we could create community and raise our kids as neighbors. 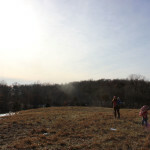 We were invited to live within a homesteading community land trust, on which three neighbors steward 10 acres of land, and together we co-own another 30 acres. This situation seemed like an ideal blend of autonomy and community. Our piece of land has a lot of wonderful features: It is located on a hilltop with ample southern sun exposure, and has an almost equal mixture of forest and pasture. 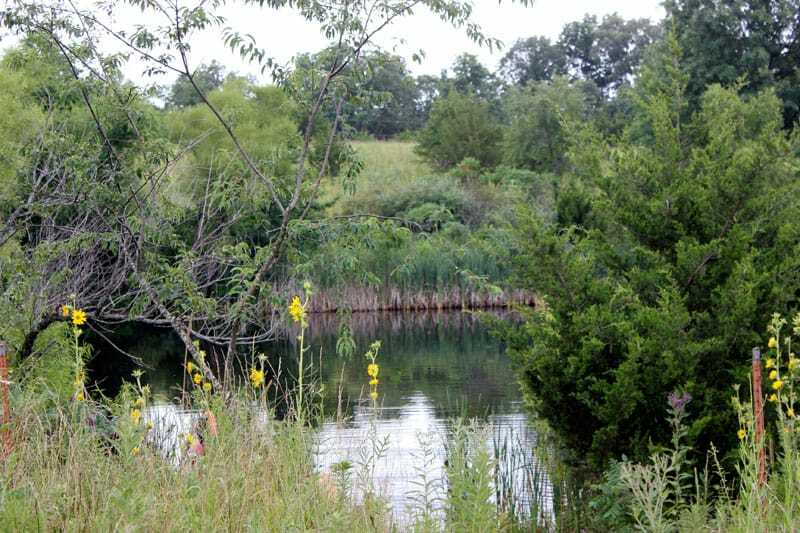 An already established one acre pond is an easy walk from our front door. The forest is an excellent privacy feature, and it also buffers us from North and Northwest winds. We have a sloped pasture that leads to a seasonal creek, so there is a wide diversity of wild edible plants, wildflowers, and grasses, and plenty of space to graze a few animals. The land was affordable and building codes are very relaxed, enabling us to build our own structures and integrate lots of alternative building ideas. On the flip side, our house and gardens sit atop a hill that had been severely eroded, so we’ve had to work hard to improve soil for growing food and fruit trees. We have very little flat land, so tilling up a large garden is virtually impossible. Our main water sources (the pond and the creek) are lower in elevation than our house, and we have no natural springs on the property. We are about 12 miles from the town where we do most of our shopping, cultural activities, etc., so we spend more time driving than I would prefer. We live in an economically depressed area, which made land super-affordable, but makes employment challenging. There are so many pros and cons to each and every place you might live, but it helps to think about your priorities and needs, and then try to meet those prioritized needs. For example, someone whose goal is to create a CSA farm is probably going to place rich soil and flat, tillable land high on their priority list. We have friends who want to grow medicinal herbs and native plants; among their needs is a piece of land that has enough forest to create shady habitat for such plants. 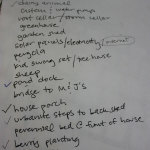 To assist you with this process, I’ve created a list of questions that will help you define your ideal homestead land. Do you wish to live rurally or in an urban/suburban setting? Is there a particular town or county that you need to live in (for schools, jobs, etc.)? 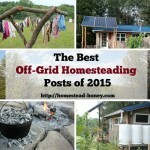 Do you have sufficient transportation to get to a more rural homestead? How important is it to you to have nearby neighbors? Or total privacy? 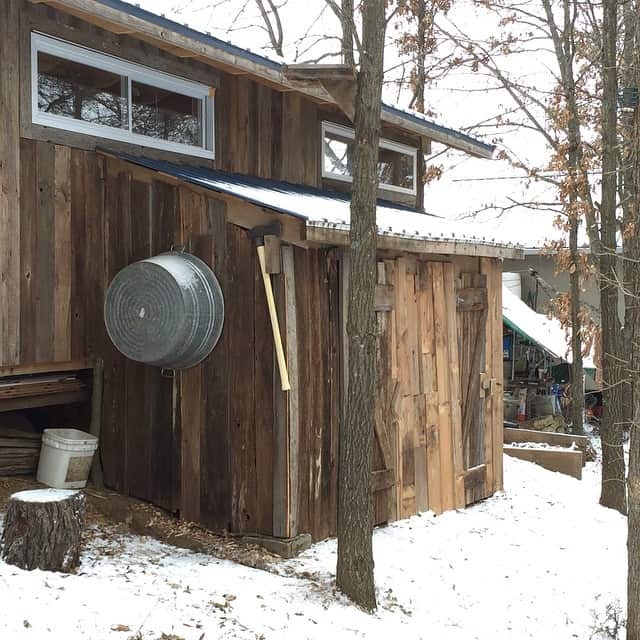 What kinds of zoning restrictions or building codes might influence what you can or cannot do on your homestead? Do you have friends, family or community nearby? 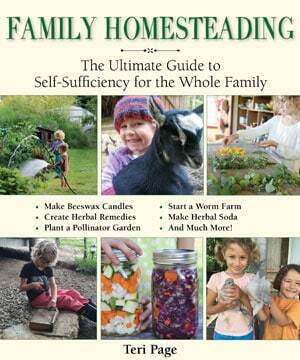 Interdependence is such an important part of homesteading, even when you are striving for self-sufficiency. 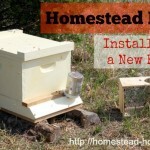 Do other homesteaders live in the area? Are they possible mentors? 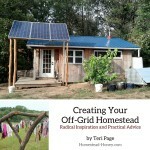 How “off-grid” do you wish to be? Are you looking to disconnect completely from utilities? Or are you wanting to still have access to certain amenities such as DSL internet, a landline phone, or grid-tied electricity? What is your preferred water source? Is water catchment legal? How is the local groundwater? What is the soil like? Is it suitable for growing food? Once you’ve answered these questions, it will be so much easier to move forward with a search for your ideal homestead with a clear vision and a list of prioritized needs. 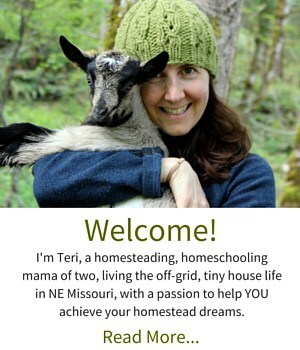 Teri, Great post! Your blend of autonomy and community is so ideal. Land trusts are already being widely accepted as a solution for new farmers to overcome the barrier of purchasing land, and it’s exciting to think that they can also be used to create homesteading communities. I would love to know more about how your land trust was set up and how it is maintained. Also, I wonder about the process of gathering a group of like-minded families and working through communication barriers. Why is it that in today’s society, it is so much easier to put one’s money and trust into a bank (through a traditional mortgage) than it is to invest (financially and relationally) in other people? We have not yet made our documents to make the land trust legal, but I expect we’ll start that process this summer. I know it’s going to take a LOT of communication, and therein lies the reason why so many people are not willing to invest in others – it takes a lot of communication and work. It’s sometimes hard to fit that amount of processing into our daily lives. And it’s not always easy! One thing that was very important to us when we were looking for our homestead 2 years ago was that it was as isolated as possible from fields being sprayed with herbicides and pesticides. Which in our area was not easy! There’s a lot of farming in our area and most of them spray. We were able to find one though and although we had to give up a few of other things we wanted (for example it is a 30 minute drive to town which is farther away than I wanted) we have been very happy with it. In being so far out ” in the sticks” as people like to tell us we were able to get the property at a very cheap price! That’s a really good point, Miranda. We also live in an agricultural area where sprays and GMO crops are the norm. Fortunately, we live up on a hill, so our watershed is exclusively from our property. And we’re about 1 mile away from the closest crops, with several forest breaks in between. What do you guys do about internet and phone service? It’s kind of an odd question given the website, but I’ve always wanted to know. I presume you just use cell phone service or satellite. Not an odd question at all! We have cellular service, and have a smartphone, so we can keep up on easy emails, updates, etc. I currently have my desktop computer at a friend’s house, and I’m caretaking her property in exchange for internet use. I’m hoping to get Internet at home soon, via a Wireless service. This was a great article. I am particularly interested on how you funded the purchases with a Co – op and what contracts if any were used? We are still in the process of creating paperwork and contracts. The purchase were funded by each landowner – the cost was equally divided by the three parties. This idea of a land trust is very interesting. I would love to do something like that. Any idea how to go about finding an opportunity like that? Most of the land trusts I have ever heard of are in urban areas. We first heard about the rural model from this Community Land Trust: http://www.redearthfarms.org/ They have a lot of good information on their website. I would suggest doing a search for “Community Land Trust _________” (the state that you live in, or want to live in). Hope that helps!